Bollywood sarees are as if tailor made for party look. Parties and events need not always require you to be seen in the same dresses and gowns in the same shade of colours. You can look equally enchanting and appealing in a saree, perhaps even more sensuous than anybody has ever seen you. A light and translucent net saree is far more mysterious and enticing than any party dress ever. Their glossy and lustrous texture, the shimmery designs of the boder or zari work or the classy lace work gives it an edge over everything else you can find classified as party wears. Next time when you are brainstorming over what to wear to a party so that your friends and colleagues are left spellbound, just get ready to buy Indian Bollywood sarees. Look no further than Bollywood if you need to throw around your weight in a glamorous way. Bollywood is all about fashion and glamour and the same can be incorporated in your look with a little knowledge about the latest trends. If the heroines can rock the party sequences in stunningly gorgeous sarees and designer blouses, you too can do the same. Learn how to choose the right saree and blouse for the perfect party look and just let desi style rule over everything else. Get the perfect sarees of your dreams that you have seen in fashion blogs, magazines and song sequences through online shopping Bollywood sarees. Here you get to browse through the collections categorized by the names of popular celebrities. So it becomes easier to locate the exact saree that had caught your attention and stolen your heart away. Here are some of these irresistible designs that can make the day for you. 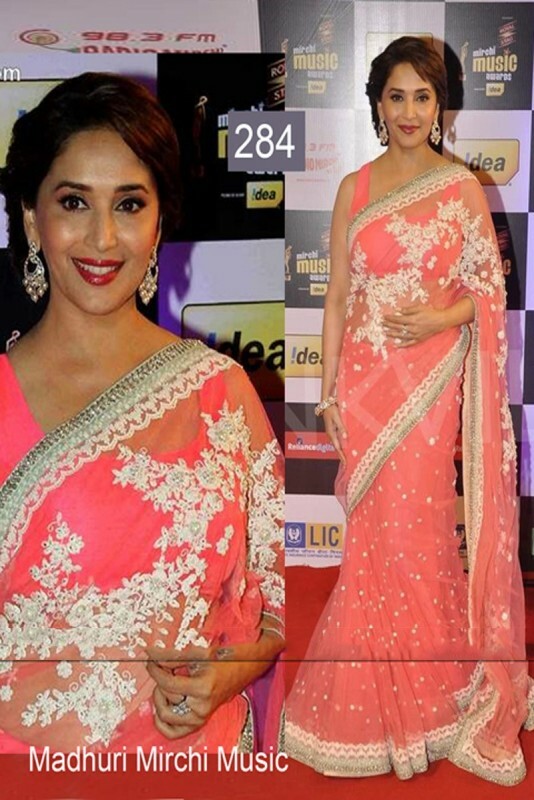 Madhuri Dixit looks gorgeous in whatever she wears. But this pink net saree brings out her grace to the utmost. The shade of pink is sure to woo the hearts of many women. On top of that the white thread work and border work is too endearing to miss out. This is a perfect option for parties when teamed up with a pink sleeveless blouse. Net saree and sleevelees blouse is almost an unstated rule for party look. Bollywood sarees are mainly georgette, net or chiffon sarees, replete with gorgeous border work, lace work, sequin work or zari work. These are worn by many celebrities these days to all kinds of events and have captured the saree market.